I&apos;m not crazy about the headlights on the Mulsanne. Ok, I just wanted to get my only complaint out of the way right at the beginning, because this car is fantastic in every other way. In fact the weird looking bug-eyed headlights don&apos;t really bother you so much in person. In photos, especially photos that are just of the front end, the headlights seem disproportionately large, but when confronted with the sheer mass of the car, you don&apos;t mind so much. The Arnage, which the Mulsanne replaces, was long overdue to be retired, but with so much having changed at Bentley since the Arnage was first rolled out, I couldn&apos;t help but wonder if the new flagship sedan would be doing the marque justice. Volkswagen, Bentley&apos;s corporate bosses, had already given us the Continental, a parts-bin engineered segment-filler if ever there was one. A very nice car, to be fair, but as utterly passionless as something designed by German accountants would be expected to be. The Mulsanne is anything but filler. We&apos;re told that Bentley was initially instructed to use a similar parts-bin approach for the design of the Mulsanne, but that they resisted. They wanted the Mulsanne to be uniquely Bentley, and although I&apos;d rather avoid using the cliche, essentially British. This need to do things properly comes though in the finished product, and the few VW parts that have made their way into the car are in no way noticeable. The interior is stuffed full of the wood-and-leather luxury that you need to make a Bentley, and even though Bentley is meant to be a driver&apos;s car, the back seat passengers get the same kind of luxury as those in the front. Many people look to compare this car to the Rolls-Royce Phantom, since they are both British super luxury cars which are similarly priced. I don&apos;t suggest doing this though, as you will inevitably miss the point. The Bentley is meant to actually be driven by the owner, while the Phantom owner will most likely experience the car from the back seat. That means that there are things like adjustable suspension and steering settings in the Mulsanne, something Rolls-Royce would never dream of putting in the Phantom. Another example of this driver-oriented setup is in the organ-stops that control the airflow of the dashboard vents. Special attention was given to these knobs in order to give them just the right amount of weight and resistance that it gives you a real sense of doing something, even if all it actually controls is an electronic switch, and this kind of attention was given to everything that is controlled by the driver. The 6 3/4-liter twin turbo V8 uses the same architecture that has been used is Bentleys and Rolls-Royces for decades, but for the Mulsanne, all of the internals have been completely redesigned. That means you&apos;ll have 505hp on tap, as well as 752lb-ft of torque. These staggering amounts of power are delivered smoothly and almost completely silently. 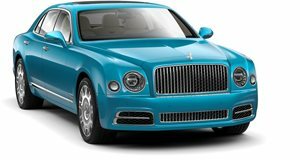 The Mulsanne really can be everything you want it to be, just so long as the $285,000 base price (to say nothing of what the options cost) won&apos;t be a problem for you.